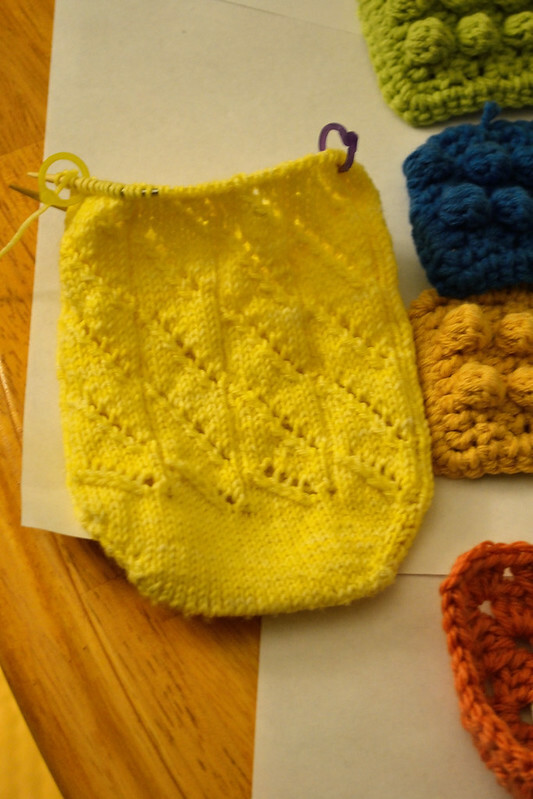 Amaryllis Musings: WIP Wednesday - It’s a sunshine DAY! WIP Wednesday - It’s a sunshine DAY! GOOD MORNING! You have no idea how excited I am to be back working during the day. Even when that day starts at 7 AM. Thankfully summer is practically upon us and waking up with sun isn't a chore. I was supposed to work the swing shift this week (3p - 11p) but it got switched over the weekend. As far as I know, I will be back on daylight for the duration, so keep your fingers crossed. Now for the update, here is what I have done this week. I started the Diagonal Lace Socks on 6/1/2012 for Nerd Wars. Nerd Wars is a ravelry group that divides members into teams and provides 6 categories a month for 3 months. You gain points for completed projects that meet the challenge theme and that have a tie into to your team. Of course all of the teams are based on nerdy culture! I am on Team Bazinga which celebrates all that is awesome about The Big Bang Theory tv show. Anyway, this sock is using the Diagonal Lace Sock Pattern from Wendy D. Johnson and Candy Skein Yarn in Banana I think the pattern looks like shooting stars which will help me satisfy the Scientific challenge. What do you think? The LEGO blanket is coming along. 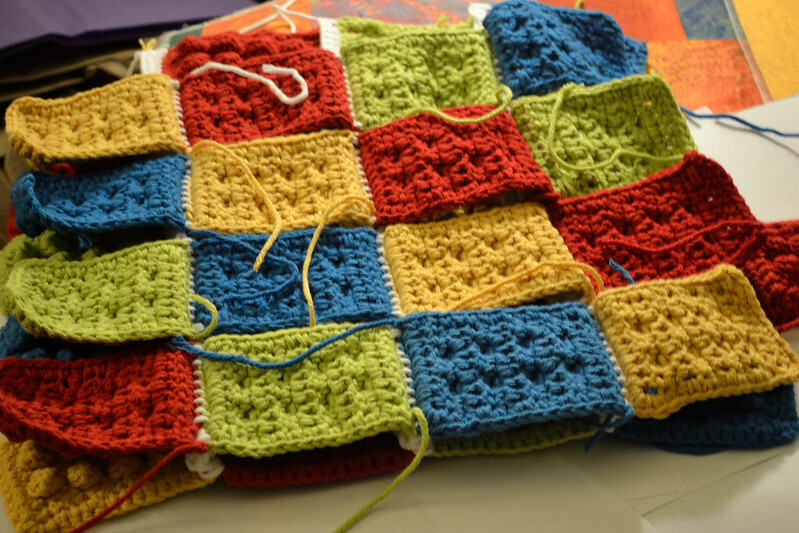 I have 5 more blocks done and joined another row to the blanket. The view from the back of the blanket. I love this view too! 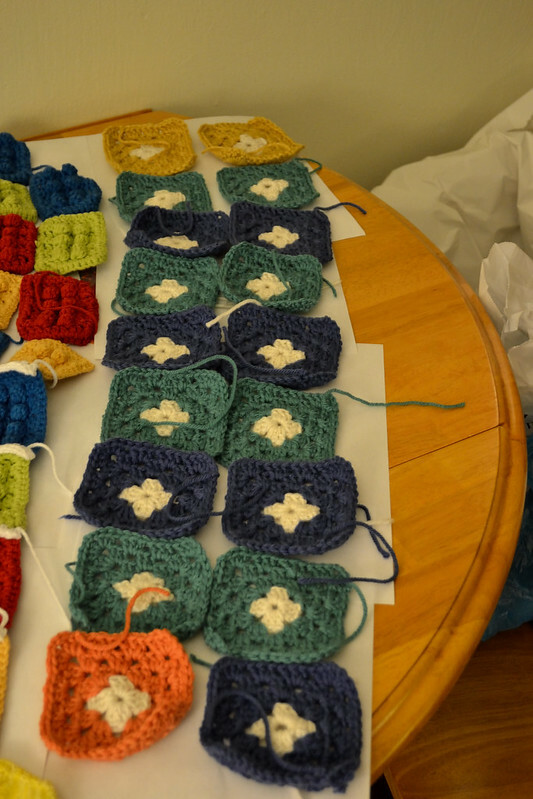 For the White Centered Granny Squares, I finished the blue skein and got 7 squares out of that and started the orange skein. I really like how the colors are working together. Debbie Bliss just has great yarn. Love the socks and the squares are amazing. I'm the worlds worst square maker. Mine are not in any way square at all. Love the lego pattern. Thanks! Making squares are all about the turns. The orange is definitely a new color in the mix, I'm loving the colors more than ever. 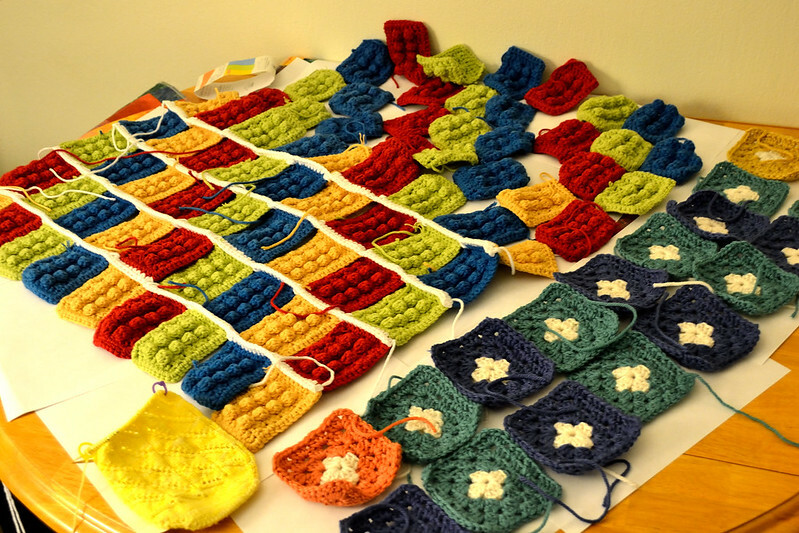 Isn't it exciting to think that before you know it, you will have finished two awesome blankets? I agree I like the slow pace of the white centered grannies as they just surprise me when I spread them out each week.